Can you believe it? Geometry EOCs are just around the corner. Yes, before we know it, our Geometry students will be taking the EOC Exam. Not unlike athletes and a coach getting ready for a big game, over the next few class sessions, my students and I will be reviewing key concepts, practicing test taking strategies, and mentally preparing for for the big test. This year, my EOC exam prep plan is slightly different than in previous years. Not only have I analyzed the data and made a prediction as to where a student’s score should fall in the Advanced, Proficient, Basic, Below Basic range, but this year I also asked students to make their own predictions. 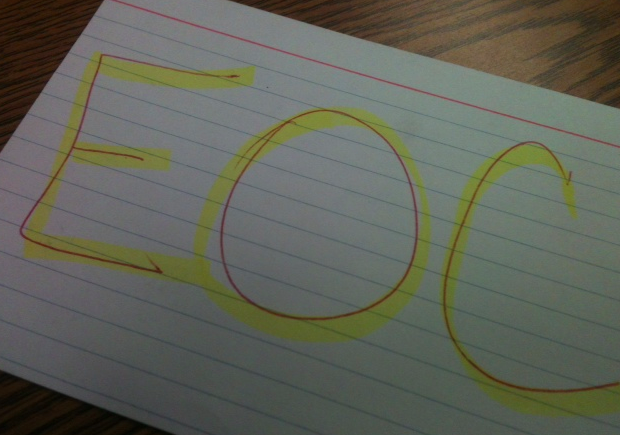 I kept the process simple by handing out a notecard to each student and then asking for an EOC exam score prediction. I carefully explained the importance of being frank and honest with expectations and that this information was for my eyes only. I also explained that over the course of the next few class meetings I would be using the notecards while conferring through the EOC exam prep process. ile I conferred with each student individually. Keeping it on a positive note, I asked why he or she made the particular prediction and then made a few suggestions in regard to past classroom performance. With only one or two exceptions, students predicted at or above what I predicted. When a student did predict higher than I predicted, I offered encouragement and congratulations without revealing my prediction. Each student left the conference hopeful and I even got a high-five or two. I am hopeful that allowing students to predict an EOC exam outcome will further personalize their learning and create deeper buy-in for the EOC Exam prep process while giving their teacher improved insight into exactly what does lie just around the corner.